The difference between economic and energy growth can be split into efficiency gains—we extract more activity per unit of energy—and “everything else.” The latter category includes sectors of economic activity not directly tied to energy use. Loosely, this could be thought of as non-manufacturing activity: finance, real estate, innovation, and other aspects of the “service” economy. My focus, as a physicist, is to understand whether the impossibility of indefinite physical growth (i.e., in energy, food, manufacturing) means that economic growth in general is also fated to end or reverse. We’ll start with a close look at efficiency, then move on to talk about more spritely economic factors. First, let’s address what I mean when I say growth. I mean a steady rate of fractional expansion each year. For instance, 5% economic growth means any given year will have an economy 5% larger than the year before. This leads to exponential behavior, which is what drives the conclusions. If you object that exponentials are unrealistic, then we’re in agreement. But such growth is the foundation of our current economic system, so we need to explore the consequences. If you think we could save ourselves much of the mess by transitioning to linear growth, this indeed dramatically shifts the timeline—but it’s also a death knell for economic growth. Let’s say we lock in today’s 5% growth and make it linear, so that we increase by a fixed absolute amount every year—not by a fixed fraction of that year’s level. We would then double in 20 years, and in a century would be five times bigger (as opposed to 132 times bigger under exponential 5% growth). But after just 20 years, the fractional growth rate is 2.5%, and after a century, it’s 1%. So linear growth starves the economic beast, and would force us to abandon our current debt-based financial system of interest and loans. This post is all about whether we can maintain our current, exponential trajectory. But how many times can we pull a rabbit out of the efficiency hat? Barring perpetual motion machines (fantasy) and heat pumps (real; discussed below), we must always settle for an efficiency less than 100%. This puts a bound on how much gain we might expect to accomplish. For instance, if some device starts out at 50% efficiency, there is no way to squeeze more than a factor of two out of its performance. To get a handle on how much there is to gain, and how fast we might expect to saturate, let’s look at what we have accomplished historically. A few shining examples stand out. Refrigerators use half the energy that they did about 35 years ago. The family car that today gets 40 miles per gallon achieved half this value in the 1970’s. Both cases point to a 2% per year improvement (doubling time of 35 years). Not everything has seen such impressive improvements. The Boeing 747 established a standard for air travel efficiency in 1970 that has hardly budged since. Electric motors, pumps, battery charging, hydroelectric power, electricity transmission—among many other things—operate at near perfect efficiency (often around 90%). Power plants that run on coal, natural gas, or nuclear reactions have seen only marginal gains in efficiency in the last 35 years: well less than 1% per year. Taken as a whole, we might then loosely guess that overall efficiency has improved by about 1% per year over the past few decades—being bounded by 0% and 2%. This corresponds to a doubling time of 70 years. How many more doublings might we expect? Many of our large-scale applications of energy use heat engines to extract useful energy out of combustion or other source of heat. These include fossil-fuel and nuclear power plants operating at 30–40% efficiency, and automobiles operating at 15–25% efficiency. Heat engines therefore account for about two-thirds of the total energy use in the U.S. (27% in transportation, 36% in electricity production, a bit in industry). The requirement that the entropy of a closed system may never decrease sets a hard limit on how much efficiency one might physically achieve in any heat engine. The maximum theoretical efficiency, in percent, is given by 100×(Th−Tc)/Th, where Th and Tc denote absolute temperatures (in Kelvin) of the hot part of the heat engine and the “cold” environment, respectively. Engineering limitations prevent realization of the theoretical maximum. But in any case, a heat engine operating between 1500 K (hot for a power plant) and room temperature could at most achieve 80% efficiency. So a factor of two improvement is probably impractical in this dominant domain. The reverse of a heat engine is a heat pump, which uses a little bit of energy to move a lot. Air conditioners, refrigerators, and some home heating systems use this technique. Somewhat magically, moving a certain quantity of heat energy can require less than that amount of energy to accomplish. For cooling applications, the thermodynamic limit to efficiency is given by 100×Tc/(Th−Tc), again expressing temperatures on an absolute scale. A refrigerator (usually a freezer with a piggybacked refrigerator) operating at room temperature can theoretically achieve 1100% efficiency. The Energy Efficiency Ratio (EER), which is displayed for most new cooling devices, is theoretically bounded by 3.4×Tc/(Th−Tc), which in this example is 36. Today’s refrigerators achieve EER values of about 12, so that only a factor of three remains. The same can be said for the Coefficient of Performance (COP) for heat pumps, which is bounded by Th/(Th−Tc). Like refrigerators, these are performing within a factor of 2–3 of theoretical limits. Lighting has seen dramatic improvements in recent decades, going from incandescent performances of 14 lumens per Watt to compact fluorescent efficacies that are four times better, at 50–60 lumens per Watt. LED lighting currently achieves 60–80 lumens per Watt. An ideal light source emitting a spectrum we would call white (sharing the exact spectrum of daylight) but contrived to have no emission outside our visible range would have a luminous efficacy of 251 lm/W. The best LEDs are now within a factor of three of this hard limit. The efficiency of gasoline-powered cars can not easily improve by any large factor (see heat engines, above), but the effective efficiency can be improved significantly by transitioning to electric drive trains. While a car getting 40 m.p.g. may have a 20% efficient gasoline engine, a battery-powered drive train might achieve something like 70% efficiency (85% efficiency in charging batteries, 85% in driving the electric motor). The factor of 3.5 improvement in efficiency suggests effective mileage performance of 140 m.p.g. One caution, however: if the input electricity comes from a fossil-fuel power plant operating at 40% efficiency and 90% transmission efficiency, the effective fossil-to-locomotion efficiency is reduced to 25%, and is not such a significant step. As mentioned above, a broad swath of common devices already operate at close to perfect efficiency. Electrical devices in particular can be quite impressively frugal with energy. That which isn’t used constructively appears as waste heat, which is one way to quickly assess efficiency for devices that do not have heat generation as a goal: power plants are hot; car engines are hot; incandescent lights are hot. On the flip side, hydroelectric plants stay cool, LED lights are cool, and a car battery being charged stays cool. We have developed an unshakable faith in technology to address our problems. Its track record is most impressive. I myself can sit at my dining room table in California and direct a laser in New Mexico to launch pulses at the astronaut-placed reflectors on the moon and measure the distance to one millimeter. I built much of the system, so I am no stranger to technology, and embrace the possibilities it offers. And we’ve seen the future in our movies—it’s almost palpably real. But we have to be careful about faith, and periodically reexamine its validity or possible limits. Following are a few key examples. The previous discussion is rooted in the technologies of today: coal-fired power plants, for goodness sake! Any self-respecting analysis of the long term future should recognize the near-certainty that tomorrow’s solutions will look different than today’s. We may not even have a name yet for the energy source of the future! First, I refer you to the previous post: the continued growth of any energy technology—if consumed on the planet—will bring us to a boil. Beyond that, we hit astrophysically nonsensical limits within centuries. So energy scale must cease growth. Likewise, efficiency limits will prevent us from increasing our effective energy available without bound. Second, you might wonder: can’t we consider solar, wind and other renewables to be more efficient than fossil fuel power, since the energy has free delivery? It’s true that unlike the business model for the printer (cheap printer, expensive ink cartridges that ruin you in the end), the substantial cost for renewables is in the initial investment, with little in the way of consumables. But fossil fuels—although a limited-time offer—are also a free gift of nature. We do have to put effort into retrieving them (delivery not free), although far less than the benefit they deliver. The important metric on the energy/efficiency front is energy return on energy invested (EROEI). Fossil fuels have enjoyed EROEI values typically in the range of 20:1 to 100:1, meaning that less than 5% of the eventual benefit must be invested up front. Solar and wind are less, at 10:1 and 18:1, respectively. These technologies would avoid wasting a majority of the energy in heat engines, but the lower EROEI means it’s less of a freebee than the current juice. And yes, the 15% efficiency of many solar panels does mean that most of the remaining 85% goes to heating the dark panel. What About Accomplishing the Same Tasks with Less? One route to coping with a fixed energy income is to invent new devices or techniques that accomplish the same tasks using less energy, rather than incrementally improve on the efficiency of current devices. This works marvelously in some areas (e.g., generational changes in computers, cell phones, shift to online banking/news). What About Paying More to Use Less? Owners of solar panels or Prius cars have elected to plunk down a significant amount of money to consume fewer resources. Sometimes these decisions are based on more than straight dollars and cents calculations, in that the payback can be very long term and may not be competitive against opportunity cost. Could social conscientiousness become fashionable enough to drive overall economic growth? I suppose it’s possible, but generally most people are only interested in this when the cost of energy is high to start with. Below, we’ll see that if the economy continues its growth trend after energy use flattens, the cost of energy becomes negligibly small—deflating the incentive to pay more for less. We start by setting energy to flatten out as a logistic function (standard S-curve in population studies), with an inflection point at the year 2000 (halfway along). We then let efficiency boost our effective energy at the present rate of 1% gain per year, ultimately saturating at a factor of two. The figure below provides a toy example of how this might look. 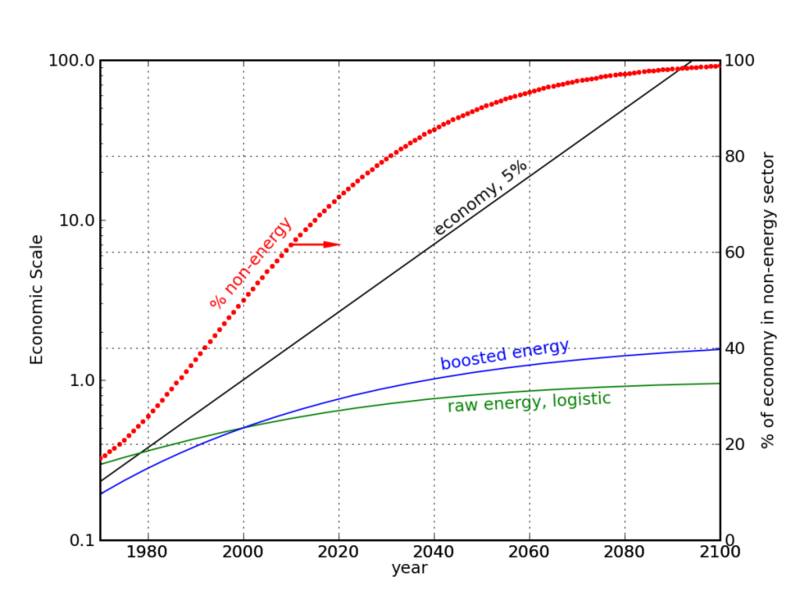 Projected contribution to a steadily growing economy from non-energy-related activities in the face of flattening raw energy available and efficiency saturation. The green curve represents the scale of raw energy available each year, while the blue curve is the effective energy available through gains in efficiency. Regardless of timescale, the key feature is that the fraction of the economy that is independent of energy availability must grow to dominate all other activities in order to keep growth alive, here reaching 98% by the end of the century. This is an untested—and possibly physically untenable—economic state. Note that the vertical axis for the economic scale curves is logarithmic. The timescale is not the important feature of the figure. The important result is that trying to maintain a growth economy in a world of tapering raw energy growth (perhaps accompanied by leveling population) and diminishing gains from efficiency improvements would require the “other” category of activity to eventually dominate the economy. This would mean that an increasingly small fraction of economic activity would depend heavily on energy, so that food production, manufacturing, transportation, etc. would be relegated to economic insignificance. Activities like selling and buying existing houses, financial transactions, innovations (including new ways to move money around), fashion, and psychotherapy will be effectively all that’s left. Consequently, the price of food, energy, and manufacturing would drop to negligible levels relative to the fluffy stuff. And is this realistic—that a vital resource at its physical limit gets arbitrarily cheap? Bizarre. This scenario has many problems. For instance, if food production shrinks to 1% of our economy, while staying at a comparable absolute scale as it is today (we must eat, after all), then food is effectively very cheap relative to the paychecks that let us enjoy the fruits of the broader economy. This would mean that farmers’ wages would sink far lower than they are today relative to other members of society, so they could not enjoy the innovations and improvements the rest of us can pay for. Subsidies, donations, or any other mechanism to compensate farmers more handsomely would simply undercut the “other” economy, preventing it from swelling to arbitrary size—and thus limiting growth. Another way to put it is that since we all must eat, and a certain, finite fraction of our population must be engaged in the production of food, the price of food cannot sink to arbitrarily low levels. The economy is rooted in a physical world that has historically been joined at the hip to energy use (through food production, manufacturing, transport of goods in the global economy). It is fantastical to think that an economy can unmoor itself from its physical underpinnings and become dominated by activities unrelated to energy, food, and manufacturing constraints. I’m not claiming that certain industries will not grow: there will always be growth in some sector. But net growth will be constrained. Winners will not outpace the losers. Nor am I claiming that some economic activities cannot exist virtually independent of energy. We can point to plenty of examples of this today. But these things can’t grow to 90%, then 99%, then 99.9%, etc. of the total economic activity—as would be mandated if economic growth is to continue apace. Together with the last post, I have used physical analysis to argue that sustained economic growth in the long term is fantastical. Maybe for some, this is stating the obvious. After all, Adam Smith imagined a 200-year phase of economic growth followed by a steady state. But our mentality is currently centered on growth. Our economic systems rely on growth for investment, loans, and interest to make any sense. If we don’t deliberately put ourselves onto a steady state trajectory, we risk a complete and unchoreographed collapse of our economic institutions. Admittedly, the argument that economic growth will stop is not as direct a result of physics as is the argument that physical growth will stop, and as such represents a stretch outside my usual comfort zone. But besides physical limits, I think we must also apply notions of common sense and human psychology. The artificial world that must be envisioned to keep economic growth alive in the face of physical limits strikes me as preposterous and untenable. It would be an existence far removed from demonstrated modes of human economic activity. Not everyone would want to participate in this whimsical society, preferring instead to spend their puffy paychecks on constrained physical goods and energy (which is now dirt cheap, by the way, so a few individuals could easily afford to own all of it!). Recognizing the need to ultimately transition to a non-growth economy, I am personally disconcerted by the fact that we lack a tested economic system based on steady-state conditions. I would like to take a conservative, low-risk approach to the future and smartly place ourselves on a sustainable trajectory. There are well-developed steady-state economic models, pioneered by Herman Daly and others. There are even stepwise plans to transition our economy into a steady-state. But not one of those steps will be taken if people (who elect politicians) do not crave this result. The only way people will crave this result is if they understand (or experience) the impossibility of continued growth and the consequences of not acting soon enough. I hope we can collectively be smart enough to make this transition. Note: A later post on the meaning of sustainability is a natural follow-on to this post. Acknowledgments: Thanks to Brian Pierini for his review and comments. This entry was posted in Efficiency, Growth and tagged economics, EROEI, heat-engines, heat-pumps, lighting, limits, thermodynamics by tmurphy. Bookmark the permalink. Whew! That was a serious load of stuff. Now I can move on to some fun stuff: the next posts will be perhaps more typical of the content on this blog. Does everyone let fly in their inaugural blog posts? Also, apologies if some of you found the Personal Statement broken link. Should be good now. Thank you for a brilliant post. I found your blog via energy bulletin, and am very grateful for clear, rational, scientific thinking when I can find it. If you ever decide to take your show on the road, we can use some coherent public speaking on energy related subjects in the Anza area. Please email me offline, as I have other related topics to disuss if possible. Thanks again for taking the time to give voice to reason. We need much more of this in the public energy dialogue. The premise is that economic growth can be achieved by a circle of bankers numbered x sitting on a beach and selling futures in sand to each other. Nobody actually stands up and moves a bag of sand increasing the efficiency over old-style ‘trading sand with monopoly money.’ Assume they are working with solar powered laptops that network themselves and they can trade sand futures for free indefinitely. This all works fine until some fraction of bankers decides they want a hot dog and something to drink. At that time real goods in the real world must be produced to sustain economic growth. Should the bankers want shelter, other physical goods or replacement laptops the whole system goes hooves-up. Any claim the economic output can be divorced from physical resource constraints is fantasy; it also appears to be dogma in any of the popular schools of economic though prevalent today. Uhm…. I don’t really agree with the distiction between energy and non-energy economic activities. There is no evidence of a completely immaterial (spiritual?) activity. Everything we do is mediated by material means: innovative ideas require brains which must be fed, knowledege that must be stored and trasnferred, end so on; modern financial services are based on an extremely complex (and energy-hungry) digital infrastructures; etc. thank You for Your very clear arguments, which are desperately needed. Thinking myself for a long time along the same lines, it is very refreshing that somebody lays this out coherently to a broader public. The method I call deductive, based on physical principles. The first is an older article by Paul Krugman about a possible dematerialized ‘celebrity economy’. Roads, buildings, cars etc have to be maintained/repaired permanently. I estimate this to be something like 2-10%/year over the lifetime of a physical product, with computers and cellphones being even at 20-50%/year, because they are simply thrown away. Clearly, there is a hard limit on the number of goods a society can maintain on such conditions. Thanks, groo, for these points, and for the link to the Krugman article (I’ve read many of his NYT pieces, but never knew this side of him). The early part of the article was excellent reinforcement of the point in this post: if we are awash in intangible services, they will cease to become valuable. Meanwhile, limited physically limited resources will become more valuable. Seems like the part of economics that has always made sense: supply and demand. But he does not extrapolate this to my point—that these conditions bring an end to economic growth. I’m surprised a physicist takes the limits of growth argument to demand an end to finance instead of funding NASA and space exploration, personally. What physics (and other hard sciences) can teach the soft sciences (and economics ofcourse, which is more of a religion) is ‘hard principles’. It so bangs in some stable posts, which set the outer limits of what can be expected and what not. If anyone leaves these limits, he should be considered an outcast from the area of rational thinking. There are even some ‘creative’ physicists like Freeman Dyson, who sorrily belong to that lot. Is it any wonder that Dyson made some suggestions, that firmly rest in the domain of the absurd? Fighting global warming by artificial CO2-trees or growing more topsoil? How? When the general global trend is exactly the opposite? Why not think about stopping the process in the first place. All the Geoengineering ‘solutions’ I know of are bordering on the absurd. This is a pity, and it should be made perfectly clear by the ‘rational’ community that this is so. Concerning Economists who base their trajectories on ‘growth’, it is the same, or even worse, because their ideas are not readily recognizable as (science) fiction, but have immediate impact on current and near-future actions. The charlatan should be identified as what he is. So at least the ‘rational’ community is cleaned out of such cranks. So the method of choice for the literate in the domain of philosophy, physics, possibility, logic, psychology is, to plug in those posts and narrow them down to the area of human inhabitability of planet and thought. This is not a very large area, it seems, at least concerning the physical aspect. In this restricted range other dimensions (imagination, the mental) can -and MUST- be developed. This is, or should be, the human condition. The big fear of western civilization, at least as I see this, is, that it has to get aware that it is in a dead end. The overarching macro-belief is strongly, if not causally connected to the ‘myth of endless growth’ and all ist nasty corrolaries like ‘discounting the future’. One other nasty consequence is, that quite a lot of ‘believers’ prefer the ‘rapture’ as the solution out of this dead end. I.e., they are so fixed to their belief-system, that they phantasize themselves out of this dire situation, by beliefing in a mythical benevolent entity, which rescues them of their predicament, which they helped create in the first place. The Herculean task, or may I call it Sysiphos-task is, to convince people to ‘think’, who are not used to that, and possibly cannot be trained to do so. I read your very excellent Topic Post on TOD. I also enjoyed the comments it sparked as well. My congratulations on a very well done piece of work. I used to be a very prolific commenter on TOD but for many reasons quit posting some time ago..Months and months ago. The background noise had risen too high by far and it became laden with ‘professional commentators, yet it remains part of my twice a day browse of the internet. A very excellent topic. I hope you post again there and I shall look on EB for some of your works. I have no degrees, only one who grew up in the late 30s and 40s on a rural farm in Kentucky and knew and lived a sustainable lifestyle. I am completely familiar with the ‘old ways’ of sustainable farming and expressed such on TOD many times but alas it was not well received so I left for other activities, yet I still live on my ancestors land and hark back to those days and in fact recreate them. For instance I went through of last winter with only a wood cookstove for heating and cooking and was quite comfortable existing on just one cord of wood (or less) and intend to do so this winter. Just wanted to say that the type of dialogue you presented on TOD was extremely worthy and spoke much to my inner self and life at 72 years of age. My past was mainframe programmer and Field Engineer for IBM for 30 years plus. Thanks, Airdale, for the supportive remarks. It is gratifying that the comments of a “youngster” like myself can resonate with with the inner self of a thoughtful elder. Like Airdale, I came here from TOD. Also like Airdale, I read there regularly, but rarely comment, because many commenters are far too certain, there. (I’m glad to see that Airdale is still alive and well.) Thank you for this pair of posts. You have a wonderfully clear style of exposition. I wonder if you might explain something. In your conclusion, you write that investment and interest rely on growth. Many others have said similar things, but I have never found a satisfactory argument as to why this is so. Most supposed explanations proceed for a while, and then preface the next step of the argument with the word “clearly” or “obviously”. (Most of the time, the argument is only this one step!) Over the years, I have come to the conclusion that these words, “clearly” and “obviously”, are, most often, a signal to the reader that says “I am going to make a logical leap here – this is a step which doesn’t really follow from the premises given. But it feels right, so please go with me”. * This is certainly the case with respect to the arguments for the necessity of growth for investment that I have seen. So, if you know the reasons why investment absolutely relies on growth, could you set them out? – or at least point me in the direction of an argument without gaps. It would be much appreciated. A few random observations. I take it you are familiar with Vaclav Smil’s extensive and detailed body of work on energy in nature and society. It’s worth investigating, if not. Smil, as I read him, comes to pretty much the same conclusions that you have — growth must stop, but that needn’t be a catastrophe. A decline in economic significance does not necessarily mean a decline in per-capita income, unless productivity (ouput per person-hour) doesn’t keep up. What it does mean is that fewer people will be employed in the declining industry, exacerbating the problem of finding new things for people to do (that don’t involve energy consumption). Stuart Staniford (http://earlywarn.blogspot.com) is examining many of the same issues in much the same way, but he has a few years’ head-start. You might like to get in touch with him — two heads are better than one, and all that. Another suggestion: It would probably be wise, if you present this argument to larger audiences, to point out, early and loudly, that we do need approximately one more doubling of global energy production, so that everyone in the world can enjoy access to safe drinking water, sanitation, hygenic food distribution and storage, electric light, and basic healthcare and education – things of which only about a quarter of us now have enough. Otherwise you risk being attacked by developmental groups as anti-development, racist, etc. With best wishes, and hopes for more people following the numbers to their conclusions, and for rational planning based on the results. Greg: I appreciate your comments. I especially love the point about the use of the word “clearly” and the like to mean “I’m going to make the next thing up.” I will work on a strong connection between growth and investment. I have not written up these thoughts before, so I should take time and try to do the argument justice (and may find in the process that I’m wrong!). And you’re right: the oil drum commenters could use a bit less conviction. How often do you see hedge words like: might, possibly, likely, would seem, etc.? Good point about stating up front that we could benefit from a bit more growth first. I’m not against growth, just the fantasy that we can plow ahead expecting the same story to continue indefinitely. I also dream of a happy state at the end of growth, if we can steer our way there. In this example Dr. Murphy shows that ‘efficency’ on average is only increasing around 1% a year. In reality, it is possibly less. Then he points out growth, at least our goal, is anywhere from 2-5% per year. Allready we can see a problem. Growth is allready out-paceing efficency gains over-all, in fact, I would be suprised if there was ever a single year where the reverse was true. Now im all for efficency, that is useing a little as possible to get as much done as I can, but civilization as a whole, is not. But one is clear, growth is outpaceing efficency and the spread will only get worse over time. In which case, at some point, we get overwhelmed by all the ‘growth’ weve been doing, then what is left? A good example is China. China has seen lots of ‘growth’ in all areas, population, economy and so on, but the results of that growth allready threaten to overwhelm the country. Pollution is allready beyond severe almost everywhere. And if the chinese are deploying ‘efficency, however measured to deal with the problems created by the ‘growth’, it is clearly not haveing any noticeable effect. I think that is really the most imporant lesson here. I really no longer see a way out of this trap. Our economy is not just predicated on ‘growth’, but waste. Many of out techologies are deliberately designed to waste as much energy, and material as possible, because our economic system rewards waste, but seldom rewards thrift. Cars are in-efficent and wasteful not just becuase of physics, but because it benefits the oil-auto cartel when they are made that way. Regarding cars, it would be vastly more efficent to not build cars at all, except for critical needs, but since it would not be economically efficent for GM or whoever not make them(ie they would go broke), they of course, do not stop making cars, they try to make as many as possible. The system rewards corporations when they build shoddy or disposable goods that must be continuously replaced and re-purchased. How can efficency EVER make headway in a system this? Globally, efficiency improvements should result in unit price reductions which should then equate to reduced GDP for the same number of goods and services. Look at it this way, energy is the driver of everything. Money is a legal mediator of that energy. Therefore, (and I have skipped a number of steps for brevity) the difference between global energy consumption growth rate and global economic growth rate is the….global average rate of inflation. If global energy consumption is growing at 2.9% and global GDP is growing at 5%, then global average inflation is 2.1%…which is about right. When global energy consumption growth approximately matched global GDP growth (pre 1970ish), the world was on the gold standard. Since gold is a physical item it cannot be inflated. Thus global energy consumption increase had to match the global gold production increase. Thus the correlation was 1:1 and global inflation was essentially nil. This is about the most coherent “EROEI” argument I have yet read and which simultaneously makes sense to the common man (among whom I count myself). Many Thanks. Some while back I looked at the total world economy (somewhat difficult to ascertain its US$ value, but there are credible estimates on the www), and then regressed it at a 1% real compound rate. It turns out that rate, the world economy in the time of Jesus would have totalled around $100,000 in 2010 $’s. Clearly this is nonsensical (unless everyone lived in a manger in a barn at the time). The point of the excercise was to demonstrate that our notions of continued economic compounded growth have no bearing on physical reality, and are purely psychological constructs for the purposes of enabling one man to gain an advantage over another (otherwise known as economics). I live in South Africa, and politicians here are fixated on the idea that we can solve our socio-economic problems by way of the panacea of economic growth. We are not unique in this. I am not a socialist or communist by any means, but it seems to me that the solution to the worlds security issues will vest far more in redistribution than in growth. I think you would call this “steady state” economics. I shall certainly continue to read your very interesting Blog. (Thanks to Dr Chris Cooper for pointing me here). Very good and comprehensive analysis! 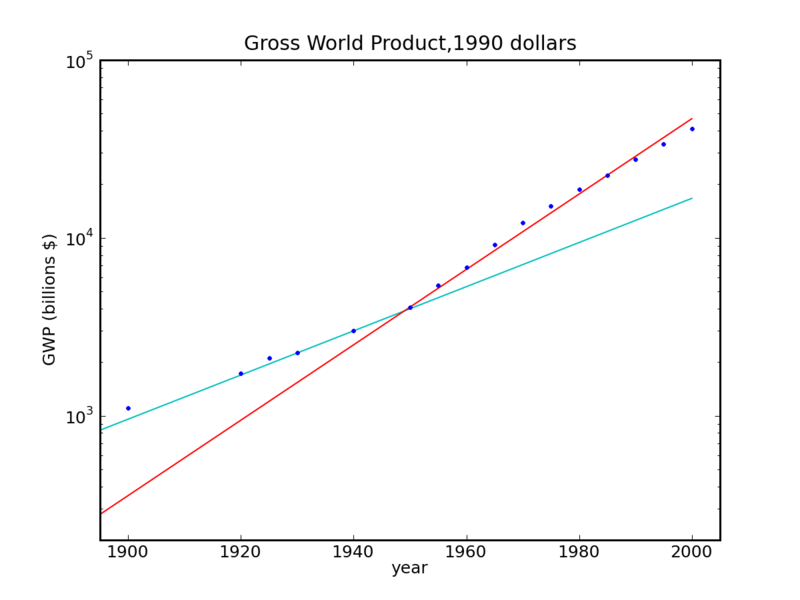 As a physicist myself I have been puzzled by the exponential growth model in economics. One thing I have learned is that economists usually calculate backwards, e.g., discount. We physicists are used to evolving the dynamics of a system. To an economist it makes perfect sense to lend somebody money at 5% interest because one would only do so if one expects him/her to be able to return it with interest. To a certain extend these 105% exist already and if not, well, we have a default. Defaults (used) to happen every day: ten thousands of companies go bankrupt every year and this is a good and healthy process. This process very well could be stationary overall. (There is a question how stable that would be …) But we do not like that: we have created all sorts of instruments, e.g., bailouts, central banks providing liquidity, etc. to prevent this natural process. Now, since we have transferred most of the risk to sovereigns we even start to bail them (Greece, Ireland, Portugal, etc.) out as well. If the physical more energy related sector does not miraculously catches up with this fiat mega bubble (the small mini bubbles which formed it should have long burst but we did not let them) we are going to have big unpleasant “surprise” at some point in the future. And as you pointed out convincingly this “real growth miracle” is becoming more and more unlikely. But even when it will happen life will go on. This planet has seen 90% of all species being wiped out (Benton M J (2005). When Life Nearly Died: The Greatest Mass Extinction of All Time. Thames & Hudson). Care to offer a citation? If anything, economics teaches about trade-offs involving scarce resources. I really like the quote from your friend Herman! Looking forward to your next posts on this subject. Dear NAME_TOKEN You have probably heard that there is only so much physical space and limited sustainable energy budget to maintain the Sol-Orbital(3) brain-in-a-vat warehouse and it’s associated computing and bio-support hardware. But fear not voyagers. With a full mind-upload you can experience the benefits of a Pure-SiliSim existence. In the virtuality the limits of the merely physical universe can be almost completely ignored! The growth of the simulated economy and the continual increase in your standard of living is: Guaranteed! As the demand of the complexity of the recorded history of the simulation increases instead of using old fashioned physical resources like ‘energy’ or ‘stuff’ we merely slow down time. That is processor commodities are distributed more sparsely among competing consciousness-threads. But don’t worry NAME_TOKEN subjectively time will pass at the exact same rate you’ve grown to love so much. Order Now for a one time offer of Priority Threading. Well I got this bit of direct mail this morning, and they fail to mention that whilst this will add orders of magnitude more time for continuous simulated economic growth, it also subjectively speeds up the outside universe to the point where Sol’s red-giant phase occurs orders of magnitude sooner. Still, I think that’s that a rather better outcome than some sort of Socialistic steady state economy, I mean damn, can you imagine living in a world without exponential GNP growth! Crazy. Ha ha ha! I was just going to suggest an analysis that incorporates thoughts on the Singularity, but this post is better and funnier than mine would have been. There is a limit to information stored by matter and computation performed by energy, so there’s a physical limit to a virtual economy before the speed-of-light limits start to really hurt. Applying some information theory and thermodynamics (e.g. that famous analysis that only changing memory requires energy, Bremermann’s limit), and estimating the bits required to produce, own, and use virtual goods, you could estimate these physical limits. What growth rate in the computronium sector would be required to keep the virtual economy growing? And when does this exhaust the resources of the solar system? I would suggest that there are several significant flaws in this analysis. 1. Firstly, it fails to consider issue of population.Population growth falls rapidly as countries become richer. Much of the increased energy use and economic growth has been linked to population growth, and global population growth is already falling. World population will peak in 40 years (according to the UN central estimate). US energy use per person rose at 1% in the 20th century, which means that per capita energy usage triples every 100 years, rather than rising by a factor of 10. 2. The early 20th century saw the invention of a large number of technologies which were very energy intensive: the automobile, domestic appliances, electric light, railways etc. These became steadily more available over the middle of the 20th century. However the 50 years since 1960 represent the period after which these were already widely available, and during this period US energy use per capita has grown at a mere 0.34%. In this scenario energy usage rises by 40% every 100 years. To dismiss this 50 years of data as being insufficient to see a trend is verging on the perverse. 4. You are arguing against a straw man. No one thinks energy consumption will continue to rise in the way you suggest. Apart from the practical concerns of generating it, what would we use it for? In 200 years, growing at 2.3%, energy consumption would be 100x our present level. Will we all drive 100x as far each year, or own 100 houses each, and 100 washing machines? Obviously not. Increased energy consumption will be driven by new technology which we find new uses for. The bulk of the work of replacing manual labour with machines has been done (in the developed world). Most people conclude that this is the reason that energy consumption in developed countries stopped growing. The innovations that have found a market in the last 50 years have increasingly been about meeting our needs for communication and information. This is not energy intensive. 4 You dismiss the idea that industries that do not require large amounts of energy input cannot come to dominate the global economy. You call them “fluffy stuff”. You cannot be unaware that services do dominate most developed economies. You suggest that food production cannot decline to become a tiny part of the economy, when it already has. Agriculture is less than 1% of the US economy, when once it was well over 50%. Certainly the US imports a lot of food, but there is no reason that more than 2% of the global population needs to be farmers at the moment, and this will decline further. The green revolution of the 1960s and 1970s raised agricultural productivity by more than 3 times without significantly more energy use, and there is every reason to think that genetic modification can do the same thing again. So we could see the number of farmers drop even further. There is no reason that economic growth cannot be driven by intangibles, and indeed it often is. Economic growth can be driven by anything that we can make that other people find useful or entertaining. We actually disagree less than you think. I set up the argument to indicate that the business-as-usual growth must stop, but I myself don’t buy the assumptions—and this becomes the whole point. Obviously if population stops growing and people have all the goodies they need, the physical growth can stop. But then my point is that economic growth will also stop, being rooted in the physical world. Some things will grow, but not in a net sense. Certainly we can have a majority of economic activity in non-energy-intensive activities, but this cannot be taken to absurd limits. Without absurdity, we have an ultimate limit to growth. By the way, I’ll bet most people wish that less than 1% of their paychecks went to food. I know that 17% of our energy does. How about interstellar travel? You can use ever more energy to accelerate asymptotically closer to the speed of light. Of course for the masses, at some point suspended animation is going to be cheaper than time dilation (maybe even before you reach relativistic speeds, lol). Otoh, the super rich of the future may find value in ever shorter subjective interstellar transit times. Or alternatively, if the difference between .9c and .99c means one ship beats another to a star in time to claim its resources (in this scenario they get 1 month of time per light year), it may be worth the vast energy required. EIA.gov tell us US energy consumption per person in btus during 1959 to 2009 rose from 244m to 308m. That’s an increase of 26% over 50 years, or an annual rate of growth of 0.47% — somewhat less than 2.9% forever. Moreover, since the big 1970s jump in energy prices, consumption per person has fallen from 357m in 1973 to 308m in 2009. That’s an average decline of 0.4% per year. Even as GDP per person has continued to grow by an average 2% per person. Yes, in a growing economy consumption of energy, like that of everything else, responds to price. The only way to get 2.9% (or 2.3%) energy use growth forever is by multiplying these energy-use-per-capita numbers by the *population growth of the past* — and projecting that *forever into the future*. But please … the population of the USA is stabilizing right now — and the populations of all the other developed economies in the world are either declining now or are about too (yes, including China.) We are entering the second half of the demographic transition. (1) energy use per person declining 0.4% per year, multiplied by stable-to-declining population. (2) energy use per person declining 0.4% per year as GDP per person rises 2% per year. How long are these trends sustainable? I love it when readers find other ways to reinforce the point. Absolutely right that implicit in my analysis was continued population growth, which few people—including me—actually believe will continue. In a stable (or declining) population, energy use stabilizes (or declines) which even sooner brings about an end to economic growth. Otherwise the non-energy-intense economy swells to become 99.99999% and beyond of the economy, which I think is untenable. But who makes “forever” an issue? Who in the economics community ever said “infinite growth” or “growth forever” is an objective or necessity — or even a remote concern? You’ll never find an economics textbook anyhwere that makes any kind of such a claim. It is a total strawman to argue against … though so many people enjoy doing so. Homo sapiens has existed, what, 100,000 years? *That’s* the scale of forever looking back, and forward too. The modern economy has existed (in only parts of the world) since the Industrial Revolution, 200 years. That’s a long way from “forever”. But in the parts of the world that have enjoyed it, life expectancy has shot to 80 from the 25-30 of all previous times and places (and is still rising) and income has nominally increased 50x — though that doesn’t *begin* to measure the welfare improvement, as even the billionaires of the Gilded Age couldn’t at any price get novocaine for a bad tooth, a polio vaccination, frozen vegetables in winter, 300 channels of cable televsion, etc, etc. Plus these very recent modern economies have universally abolished slavery for the first time ever in history, deposed Kings to create the first working democratic political systems, brought universal sufferage, civil rights for women and other formerly oppressed groups, universal education, and a whole lot of other welfare benefits so many today take for granted, compared to the bad old previous 100,000 years. Such are the benefits of economic development. The #1 objective that the economics community *does* have is to spread this welfare to the rest of the world, so that the *billions* of people who still lack these material, social, poltical benefits will obtain them. That you *will* read about in econ textbooks. How long will that take …oh, another 200 years, maybe. So if we get world economic real growth of between the bounds of 2% to 4% for the next 200 years, matching the last 200, then we can attain welfare for *everybody* that matches that of the very best-off few of us today — plus really a good deal more than that! distributed *far* more evenly than today. Now, physical scientists of all people ought to know that “200” is a rather smaller number than “infinity”, and 200 years is a good deal shorter time period than 100,000 years, much less “forever”. So what the heck is all this “infinity” and “forever” nonsense? *If* you all have a reason to believe a particular problem might hamper economic growth from continuing on course for 200 years … *and* you want to help five billion poor to dirt-poor people join the ranks of the well off … *then* you might want to offer some constructive suggestions to help get past that problem. Is energy consumption that problem? As population stabilizes/shrinks in developed economies, and energy consumption declines per capita with economic growth in them, I don’t see it. Is mineral consumption? USA 1965-2005, per capita real GDP +125%, tons of mineral consumption -40%. Don’t see that either. There are other problems though — and all suggestions to help solve them are appreciated. But if y’all want to say, “economic growth just can’t continue like this unto infinity!”, that’s OK, no economist will care. The economists will just be puzzled why you are so seemingly emotionally invested in the concept. After all, it’s no different than an economist claiming it really seems sure that someday we will/won’t contact alien civilizations or something like that. Fun speculation, but anything more, really? If you were driving at top speed and saw a signpost that said: “Cliff ahead: road ends,” I’m guessing you would not object by saying that “ahead” is too vague and could be anywhere—meanwhile the wind in your hair is quite pleasant and you’re enjoying the speed that brought you this far so quickly. Rather, I’m guessing you’d probably change behavior even without knowing a precise distance (at least I hope so). Likewise, I feel I don’t have to put an explicit predicted timescale on the problem (easily wrong in either direction), and that it is a sufficient “service” to our fellow travelers to point out that our entire system/narrative is not built for the long haul. It’s a dire enough warning that we should sit up and pay attention so we are not caught off guard if we begin to stumble. Energy consumption per capita: -14.3%, average decline of 0.4% annually. Energy consumption per real dollar of GDP: -52.7%, average decline of 2.1%. This is helpful info, but it does not get at the physical improvement in efficiency (like miles per gallon, or kWh for the refrigerator). GDP and energy are not perfectly coupled, so GDP can go up for reasons other than efficiency (e.g., more service). The first graph in the post shows the GDP outstripping the nominal 2.9% energy growth by a similar 2% amount. I’m quite happy with such things continuing for decades, but not forever. Ah so no wonder US real median wages have stagnated since the 70’s? No wonder that the US hasn’t created any jobs in the last decade while adding $26 Trillion to it’s debt. Sure GDP ‘grew’ but it cost $6 in debt per $1 of GDP growth. And resulted in no jobs & higher inequality. Also your fantasy energy consumption figures per capita don’t include the energy embedded in imports from China – where US & EU manufacturing is now located and is now the largest consumer of energy in the world. US Debt started soaring in the early 80’s & energy use is stuck at 90’s levels. No wonder the stock Market has been stagnant, real wages are stagnant & no jobs are being created. Just wait till the next Market crash to realise how impoverished Amrika really is. When US energy consumption statistics are quoted, do they only include domestic consumption of energy? For instance, electricity, fuels, etc. that are consumed within the United States (or at least by US agencies)? Or does it also include the energy used to produce goods that are consumed primarily in the US? “Per capita energy consumption” as a term, sounds (to me at least) like it should include the latter, if is to be an accurate physical measure of the energy required to sustain the activity of the individual. My real question is: Are any considerations made for the situation that over the last 40 years, the US consumption in heavy industrial products has been moving overseas and that the energy which was previously being consumed in the US directly is still indirectly consumed here? As far as I know, the majority of energy use comes from manufacturing and not from residential or commercial use. If those figures don’t report such indirect energy consumption, is it still fair to say that US energy consumption per capita is decreasing? Or maybe it does include it. I’m just asking. Thanks. I am unsure any government will seriously consider solid state economics. When resources become scarce enough for the idea to get real traction the far more likely outcome is war that would eventually kill enough people so that those left would no longer have resource constraints. What really isn’t accounted for in your calculations is that while *global* energy usage has grown at that rate, it is actually much less than that once a nation is developed. The US’s energy use has decreased somewhat over the last few years, even as GDP increased or remained flat. Emerging economies like China had massive increases to their energy usage. Now, as their economies become fully developed, it is not unreasonable to assume that their energy consumption will level off as ours has. As such, we can use current US energy consumption per capita as a probable eventual model for the energy consumption of everyone else. That paints a much rosier picture. So, while this article is fairly interesting, the overall fundamental assumption isn’t valid–that economic growth in developed nations necessitates an increase in energy usage, and it doesn’t. GDP can grow simply by energy becoming more efficient, meaning the same inputs produce more outputs, and we have seen that in various nation’s economies. If you’ve concluded that energy growth won’t continue forever (in other words, the suppositions of my analysis are absurd), then I have succeeded. Yes, when you layer on “realities,”—like population saturation, etc.—endless energy growth is clearly nonsensical. I addressed whether the economy can continue to grow through continued improvement in energy efficiency. To some extent, absolutely. Just not for very long, on the scale of things. Thanks for these two articles. They are very thought-provoking. However, I think there is a weakness in your argument (in this article, not the first one). Your arguments that energy consumption cannot increase indefinitely, and that energy efficiency in the manufacturing sector cannot increase even very much more, seem cogent. However, I think its difficult to put limits on how quickly the non-manufacturing economy (the non-physical economy?) can grow. For example, above you say that it is implausible that an “increasingly small fraction of economic activity would depend heavily on energy, so that food production, manufacturing, transportation, etc. would be relegated to economic insignificance”. But agriculture, for example, has already been relegated to economic insignificance in the modern US economy – it accounts for 1.2% of GDP. Yet there is sufficient food in the US to feed everyone (leaving aside whether it is distributed equitably). Agriculture has become economically insignificant, but it hasn’t *ceased*. You say “This would mean that farmers’ wages would sink far lower than they are today relative to other members of society, so they could not enjoy the innovations and improvements the rest of us can pay for”. No, this simply isn’t true. There would be fewer farmers, more mechanization, more hydroponics. This has *ALREADY HAPPENED* in the US economy over the last 150 years.The US economy has gone from a situation when (I’m guessing) 50% of the population was engaged in agriculture to a situation where less than 1% are). Why is it ridiculous that the same will happen 1) to agriculture and then 2) to manufacturing and then potentially 3) all forms of physical activity in the global economy over the next 100 years? Everyone agrees that exponential growth cannot continue indefinitely in a finite universe. I think you do a great job of showing in the first article that the limits on energy consumption on Earth are closer than we think. However, the question I guess is whether ‘economic growth’ has a *meaning* beyond ‘increased energy consumption’. Assuming that you could meet everyone on Earth’s need for food and shelter what would they demand more of beyond that? I haven’t quite thought this through enough to be coherent – but I think the ultimate ‘form’ of economic growth is computation. There *are* limits on how much computation you can achieve given the entropy and energy resources of the Earth – but my guess is that these are a long way off. I would love to hear your thoughts. Economic growth has already ended. Private sector GDP peaked a few years ago, the last few years have all been about Government money(debt) pumping. Soon Italy is going to be bankrupt, when that happens, lights go out in the global economy – too connected, too complex & too fragile. The great depression will look like a cake walk. And of course activities like studying physics. Doesn’t sound too bleak to me. Or more likely far fewer people would farm the same amount of land, or most farm operation would be contracted out to automated systems. Tractors already have auto-steer systems, a completely automated planting is not out of the question today, it’s just a question of safety and delivering the tractors to the feild. Also a lot of the cost of food now is in the processing and distribution. Or food is simply grown in a vat, and farmland is left to fallow. Today there are no farmers, only agribusinessmen. The past half-century has seen a growing entanglement of agriculture and the financial institutions. Banks thrust loans onto farmers so that they might buy the newest, ever more expensive, combine with the GPS, stereo, and air conditioning ( and that new pickup truck too). Just as with the housing bubble, at some point the commodities markets will suffer a trauma, and the banks will own, but be unable to tend, America’s bread basket, and our fields will be fallow. Your statement that “The Boeing 747 established a standard for air travel efficiency in 1970 that has hardly budged since.” is misleading if not wrong. Although it does nothing to alter the core substance of your argument, it does not credit the impressive advances in efficiency the aerospace industry has steadily delivered. For example, the analysis of Peeters reviews some attempts to put a number to this, they seem to range from 1.2 to 2.2%/yr improvement. Of course, a few tenths of percent on a relatively small component of global energy usage won’t do anything to curb an exponential growth trend. However, giving the impression that air transport efficiency has not improved since 1969’s 747 is not appropriate. The numbers I have say that a 747 uses 3.1 liters per 100 passenger-km, while the much newer 777 ranges from 2.9 to 3.2. This was a very cursory search, so there may be some devils in the details. Maybe the 747 number reflects some engine upgrade and is a modern number. But I’m doubting the jet engine efficiency has doubled since 1970. Could be wrong, of course. You will find that jet engine efficiency has in fact nearly doubled. This progress has been (and is) remarkable. In addition, this improvement has been (largely) fleet-wide. Although I can buy a fuel efficient (40+mpg) car today, I can also buy a gas guzzling car (~10mpg). You can’t choose to buy an aircraft with 1970’s level of efficiency today. The market forces driving these industries couldn’t be more different. Consumer automobiles have had relatively weak pressure to pursue efficiency. However, fuel is a large fraction of an airline’s operating cost, making fuel efficiency a constant need. The Carnot efficiency really doesn’t tell the whole story here. The Brayton cycle benefits from temperature increases (Aerospace jet engines have been _the_ driving factor in high temperature metallurgy. We focus on T4, the temperature at the entrance to the turbine section.) but it also benefits from other changes to the cycle. OPR is the overall pressure ratio through the compressor. BPR is the bypass ratio, the amount of air flowing through the fan to the amount of air flowing through the engine core. T4, OPR, and BPR must be changed in concert in order to advance an engine. That said, if you want one number as an indicator of fuel efficiency, go with BPR. I suspect that unintentionally, you aren’t comparing a 1970’s 747 to that 777. The 747-100 first flew in 1969. The -300 in 1983. The -400 in 1988. The -8F in 2010. The -8I will fly soon. Also, the 777 first flew in 1994. If you are taking those numbers as ‘today’s performance’ then you miss 17 years of progress on the back side. Most of today’s 747 fleet operated by first-world airlines are -400 variants. The earlier aircraft have been sold to third-world airlines, converted to freight, and retired/scrapped. If you used a -400 (1988) as the 747 level of performance, you miss 19 years of progress on the front side. 747-400 to 777-200 represents only six years of development. The JT9D-7A used on some early 747’s had an OPR of 22.5, BPR of 5.1, and T4 of 2385 F.
The CF6-80C2 used on most 747-400’s had an OPR of 30.4 and BPR of 5.15. The GE90 used on most 777’s has an OPR of 40 and BPR of 9. The GEnx on the 747-8 has an OPR of 43 and BPR of 8.6. T4 performance is closely guarded by the industry and is not an easy number to find for engines in production. Single crystal nickel superalloy turbine blades are an incredible feat of engineering. Today’s engines are impressively more fuel efficient than past engines, but they are also quieter, more reliable, and safer – all with fewer emissions. You may not see the changes, but the aerospace jet engine industry has consistently been at the cutting edge of prime mover heat engines. Weight, efficiency, and performance are far more important for aerospace vehicles than any kind of terrestrial vehicle. All major turbine engines (including power generation and marine) are derived from aerospace engines. Aerospace engines are the cutting edge. Tomorrow’s engines continue the march. Bypass ratios are being pushed higher, novel engine architectures are being developed in this pursuit. Geared turbofans and three-spool engines are two approaches. There are also the Unducted Fan (UDF) or Ultra High Bypass (UHB) engine concepts which have bypass ratios of around 30. NASA and the engine companies are working on the noise associated with these concepts, but the potential efficiency gains are truly astounding. Thanks for the most informative correction to my initial statement! I would gather, then, that the comparable energy requirements to push people along (using similar-generation engines) in a 747 vs. a 777 speaks to the unyielding energy requirements of pushing people through air at Mach 0.8. That part has probably seen little change. I guess I should not have been surprised that combustion efficiency improved in parallel to that of car engines (though by independent paths). Here things start to get complicated. Yes, the majority of the progress in aircraft efficiency has come through the engines. The Peeters paper estimates it as about 70% of the benefit from propulsive advances and most of the remainder to the aerodynamics. This is difficult to pin down because airplanes are complex integrated systems. (The Peeters paper should be freely downloadable to everyone). For one, commercial airplanes aren’t designed for minimum fuel consumption, they are designed to maximize profit to the airframer. Their customer, the airline, wants an aircraft which will maximize their profit often by minimizing lifecycle cost (LCC). This includes purchase price, interest, insurance, maintenance, fuel, crew, and resale value/disposal costs. The airframer tries to minimize LCC for the airline, but they will trade LCC to lower production costs, capture more of the market, or drive their competitor out of the market. The airframer actually has an adversarial partnership with the engine manufacturer. Imagine the negotiations of purchasing your engine separate from your car. This is a high stakes game and the maneuvers back and forth are dizzying. In all, the advances in efficiency have come because they maximized return on investment to the airframer. They (and the engine manufacturer) could choose to build airplanes/engines which consumed less fuel, but they would give something up. They would be heavier, more expensive, less reliable, harder to maintain, etc. Because of those things, they would make less money — so they choose a different objective to maximize. The other facet of these complex systems is in the tight physical interaction of the systems. A materials benefit (say high strength/weight composites) might not yield a lighter aircraft. Instead, it us used to make a longer, thinner beam (the wing) at the same weight. An advance in one discipline is traded to another discipline. It may appear that the structures have not advanced, but instead, the significant advances have enabled other gains in the system. When considering an entire aircraft, one must trade _all_ of the contributing disciplines against one another to yield the best aircraft. None of the individual disciplines get everything they want. To your point about the work required to push a certain amount of stuff through the air at Mach 0.8. You are correct that there are fundamental issues and limits we are up against. In an aircraft, we not only have to deal with the work to push the stuff through the air (parasite drag), but also the work required to lift the stuff as we go along (induced drag). As you note in a later post, the parasite drag scales with the square of velocity (V^2). The drag coefficient has some to do with frontal area, but the parasite drag of sleek aerodynamic shapes of aircraft are more dominated by the wetted area. Other factors in the aircraft make the wing planform area (S) more useful and we generally use that as our reference area. On the other hand, the induced drag of an aircraft scales with 1/V^2! Induced and parasite drag are strongly opposed. Flight at minimum drag (thereby maximum L/D) requires flight where parasite and induced drag are equal. For various reasons, we seldom fly at 50% induced drag, more common numbers are in the 25% to 10% range — so V^2 is still important. That said, the induced drag is also proportional to the span loading squared — (W/b)^2 — where W is the weight and b is the wingspan. There is an old adage in aircraft design that ‘the best way to reduce induced drag is to reduce weight’. This also highlights the importance of wingspan. Increase the wingspan and you can reduce the drag on the aircraft. We often need to maintain the same wing area, so this leads to a longer & skinnier beam — without weight penalty (remember the W^2) — and that requires better structures and materials. As engineers, there is a lot more we have been able to do to reduce induced drag than parasite drag. Achieving extensive laminar flow over an aircraft has promise to dramatically reduce parasite drag. This panacea has not been realized. In order to fly near 50/50 induced/parasite ratios – with higher span wings, you need to fly at higher lift coefficients. This requires an increase in wing loading (W/S) – weight divided by wing area. While high W/S is great for cruise, it is bad for takeoff and landing. Consequently, long runways and advanced high-lift systems (flaps & slats) can be viewed as technology enablers for highly efficient cruise flight. Everything is connected. This is what makes aircraft design fascinating and fulfilling to me. There are incredibly subtle, complex, and nuanced interactions which arise out of very simple physical principles. It will always provide great challenge. You are making three separate arguments of a very different nature. One argument is unassailable – exponential growth of anything tangible or entropy-producing cannot continue indefinitely in a finite universe. You could even have left this part of the argument at just the inevitable heat death of the universe. As we understand physics today, everything (exponential or not) must stop at that point. The second argument is that we must recognize the point when we hit the limits far in advance and prepare accordingly or suffer dire consequences. You don’t make any argument to this effect, it’s just assumed. I can say with as much evidence (none) that winding economic development down 10 years ahead of hitting the limits will just bring the hardship of hitting the limits 10 years sooner. Not to say, being wrong about this and unnecessarily foregoing, say, just 20 years of exponential growth is a violence upon humanity more gruesome to contemplate than most any realistic disaster I can imagine. You are not necessarily wrong, it’s just that you don’t bring any arguments to the table. The third argument is that these issues are of actual immediate concern and so (by the second argument) should be acted on now. You don’t say so explicitly, but the tone of your article expresses this argument clearly. For example you write: “But not one of those steps will be taken if people (who elect politicians) do not crave this result. The only way people will crave this result is if they understand (or experience) the impossibility of continued growth and the consequences of not acting soon enough. I hope we can collectively be smart enough to make this transition.” You don’t bring much evidence to the table for this third argument either – that our economic growth has taken us so close to the ultimate limits of the universe that growth is soon to be impossible. Economists don’t worry about this, not because they are ignorant, but because they just disagree that it’s a problem for the present. On a different note, your automobile article is based on wind resistance. Wind resistance is eliminated, along with rolling resistance, for maglev vehicles traveling in a vacuum. We’ve got trains like that already, so it is not a far-fetched technology to imagine to be wide-spread in a far future. I also agree that this needs to become a national subject as of 30 years ago (or more!) This is really the *root* issue in regards to environmental issues as well: negative externalities. This may be the hive mind behind all negative externalities! Tom Murphy, I strongly strongly urge you to read Ursula Le Guin’s The Disposessed. Please. It is a very excellent novel that touches on a lot of the issues you bring up and has many ideas in regards to a steady-state economy. Thanks for this great blog I will be following for sure! My father used to call it, “chasing the carrot.” That was in the 1960’s. The donkey, obviously, is not supposed to get the carrot, its only there to keep him moving forward. Today, I can’t even see the carrot. All I can see is the stick. I assume there is a carrot, because of my early training. But looking on the bright side, if society no longer has to bear the cost of supplying the carrot, if I can do it myself, from my imagination, surely that’s a savings. I keep working for a house I’ll never own, and even if I have no debt, I am still indebted to a society which must must must find another 5% in economic growth this year, even if it means teaching a donkey to use a pen. Until next year, when unfortunately, that donkey’s job ends up being outsourced to a donkey in India to find yet another 5% from somewhere. Bring on the Steady State. I’m ready now. This is a worthwhile essay, but I wish it would be more explicit on what it means by “growth”. Are we talking population, physical output, economic activity or just GDP (as the graph suggests)? I would agree with (1), but would disagree that there is some known limit, as it is a question of trade-off rather than some objective hard ceiling. I have not seen any argument such as (2) in the essay above, although it is implicit as it jumps into (3) directly. A general point regarding (3): No scientist or economist can pretend to know the optimal size or growth rate for any of these metrics, just like they cannot know the optimal number of shoes to produce. There is too much information which is local, individual (subjective value), changing over time, and not measurable or quantifiable. Hayek and Mises wrote on different aspects of this (see fatal conceit, and economic calculation problem). The link to Herman Daly’s “steady-state economic system” is fluff. For example, a graph illustrates the existence of some optimal economic scale in some abstract sense but doesn’t address how such a value could be determined or whether it is even knowable. My view on this whole thing is that the discussions around growth usually come from politicians, but individuals don’t really care (they care about their preferences and standards of living). Also, some economists talk about growth, but I suspect they often mean “development” instead (meaning satisfying more wants more efficiently using accumulated capital goods/skills/knowledge/institutions). Development is not measurable however (and it doesn’t make sense to talk about limits of development). Conversely, people who talk about limits to growth should realize the question of size is really a question of trade-off (within certain constraints) and should understand how the market discovers and tends towards the right trade-offs and adapt to changing constraints, before jumping to intervention or some mythical new “system”. Just a little quibble, historically there were some “tested” steady state non-growth systems. Another, that comes to mind, would be the Medieval Theocracy of Tibet. All had run out of technological (at that time) or geographic means of expansion and had reached a kind of equilibrium. They lived a fairly grim life and the Malthusian nightmare was just one failed harvest away. Terriffic article , keep up the good work ! Not *all* physics calculations are sobering … some give us very substantial grounds for optimism. By this capacity metric, magnetic resonance capacity has evolved from 10^-24 bits-per-second in 1946 to 10^-5 bits-per-second today … a doubling time of 12 months, that has been sustained (on average) for 65 consecutive doublings. Quantum information theory tells us that we have about 27 more capacity doublings still ahead of us, to a single-atom channel capacity of about 5000 bits-per-second (the upper bound is set by four physical parameters: the saturation magnetization of ferromagnetic materials, the size of biological molecules, the gyromagnetic ratios of electrons and nuclei, and Planck’s constant). As we approach this capacity, the grand enterprise conceived by von Neumann in the 1940s and again by Feynman in the 1960s becomes feasible — to observe “every atom in its place” in every organism of the biosphere. Indeed, this enterprise already has beginning, and in coming decades is expected to accelerate … well … exponentially. Here the point is that every century is characterized by grand enterprises, and physics gives us every reason to expect that the 21st century’s grand enterprises will be fully worthy of the traditions of the Enlightenment. He argued from the supply position that economic growth couldn’t continue forever. He was proved partially wrong as we developed alternative sources to coal. The thermodynamic argument however shows that whatever substitutes we have we will hit limits – its a generalisation of this argument. The Jevons effect is that if we increase the energy efficiency of something we make it cheaper and so will incentivise its consumption. So energy efficiency generally wont work. What matters is whether there are physical limits to consumption of that good. For example if fridges get more efficient we might buy more fridges, but our consumption of fridges, and electricity of fridges is limited by the costs of land to put fridges on and the amount of food we would want to buy and freeze. So whether or not increasing energy efficiency of a product increases gross energy consumption or not really depends on the income elasticity of consumption of that good compared to other goods (i.e. marginal substitutability). Most classical economists did not believe in infinite exponential growth – see for example JS Mill. For good reason their models saw growth coming from expansion of economic activity which had limits. There is a hidden assumption in your model I think that the economy is global. Rather classical models going back to Cantillion assume it is spatial, bounded and expanding, and critically economic growth is regulated by the cost of producing food at the margins of cultivation – where there is no economic land rent. If the expansion of this margin is halted a driver of growth ceases. Early (and now sadly forgotten) economists such as Torrens as a result proposed global expansion through colonialism to put back the day of steady state. Within a generation we will have reached the planetary limits of expanding global food production spatially. I’ve been writing about the economic implications of this in a series on my blog http://andrewlainton.wordpress.com/2011/06/09/wheat-on-the-savannah-capitalisms-last-frontier-1/ Including some articles, some more to be written, on why the Roman ‘steady state’ system mentioned above collapsed. Oh forgot your example of transfer payments to food producers to keep them employed. If so many people left the land because of better wages elsewhere that agricultural wages would rise because you cant substitute for food, or governments would subsidise staying on the land. Hence some sectors can continue even though they arnt improving on productivity at all – providing other sectors are growing to pay for the higher cost goods. Doesn’t Information Theory identify limits similar to these for even “service” economic growth? It seems to me that we can complete the line of thinking in this article, and assert that economic growth too has a brick wall, just as energy growth does. I’ve been saying for years that assumptions of continued exponential economic growth must lead invariably to disaster. I’m glad to see a (somewhat) formal argument in support of this. I don’t think food prices get cheaper as food becomes a smaller fraction of the economy. Imagine a society with GDP of $300, split over 300 people, each making $1 a day. Suppose they spend 50 cents each on food, and 50 cents on non-food items, so that food and non-food comprise a 50/50 split of GDP. Now suppose that innovation dramatically increases the product of non-food items, so that they are now produced in 9 times the abundance that they were before. 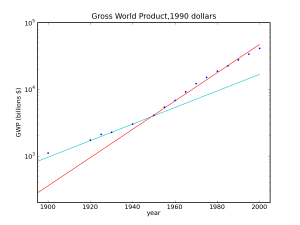 The new GDP is (9*0.5)+(1*0.5) = 5 times the old GDP; it is now $1500. Assume that the monetary authorities (i.e. the Fed) has kept the money supply growing at the same rate as the economy, so there is no inflation. Then there are 5 times the goods and services (9 times the non-food goods and services) and 5 times the money to go around. Instead of spending $150 out of $300 on food, the nation now spends $150 out of $1500 on food. Each citizen spends 50 cents out of their 5 dollar income on food, instead of 50 cents out of their previous 1 dollar income. The same amount of food, the same number of citizens, the same amount of money being spent on food, ergo the price of food is unchanged. I think your error stems from accounting for the increase in GDP, but not realizing that paychecks grow to match that; after all, GDP is just (by one accounting method) the sum of all paychecks.